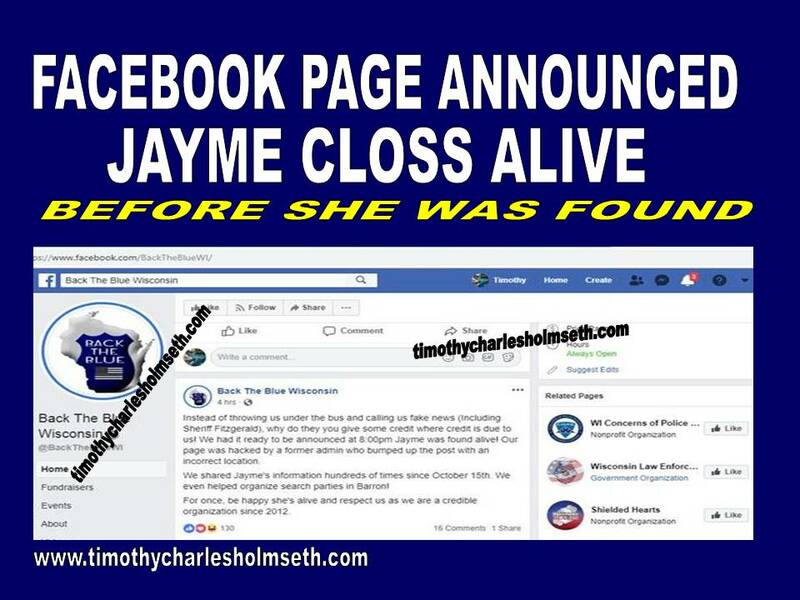 The police promoting Facebook page ‘Back The Blue Wisconsin’ had a press release prepared to announce Jayme Closs had been found alive – before she was even found. Timothy Charles Holmseth question: Why were you going to release it 8:00 P.M.? It’s mid-afternoon. What was so special about 8:00 P.M.? You believed you had just learned a missing child had been found so you prepared a press release and slated it for 8:00 P.M.? Why not release it immediately? That’s what anybody else in the whole wide world would do. Why 8:00 P.M.? After Sheriff Fitzgerald announced Jayme Closs had not been found – the teen girl who had been missing for nearly three months WAS found in Douglass County, Wisconsin. She was reportedly found walking around in the cold looking for help. 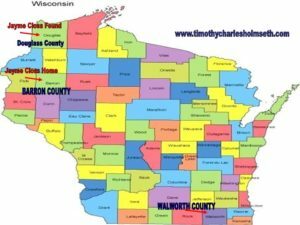 Timothy Charles Holmseth question: What time was the 911 call made reporting Jayme Closs had been found by a woman walking her dog? Sherriff Fitzgerald said the Facebook page announcement was “fake news” and noted that although there was a strong police presence on the other side of the State in Walworth County – it had nothing to do with Jayme Closs. Here’s what was going on in Wadsworth County. On January 10 in the early afternoon FOX NEWS reported ‘Remains of 2 bodies found in burn pit in Walworth County’. That’s why there was a strong police presence in Walworth County. Timothy Charles Holmseth observational questions: So you had a press release ready to publish at 8:00 P.M. that Jayme Closs was found alive. The press release is prepared before she has even been found (according to the Sheriff). However, for whatever reason, you are confident she has been found. While your waiting for 8:00 P.M. to roll around a former administrator ‘hacks’ in and announces Jayme has been found in Walworth County (southern border of Wisconsin). Barron County Sheriff Fitzgerald gets wind of this and gets pissed and announces the Facebook announcement is not true and Jayme has not been found. Then – a little while later Jayme IS found walking in the cold looking for help in Douglass County (northern border of Wisconsin) which is two counties away from Barron County. 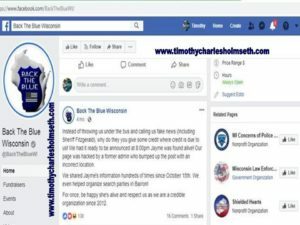 Why would both a CURRENT ‘Back The Blue Wisconsin’ Facebook page administrator, and, a FORMER ‘Back The Blue Wisconsin’ Facebook page administrator who ‘hacked’ in, BOTH be involved in publicly announcing that a missing child had been found, all based upon nothing more than police chatter on the other side of the State? Only to have the little girl MAGICALLY appear alive a few minutes later? Life doesn’t happen this way folks and everybody knows it. Don’t trust what you are being told. Dumber question: Since bodies were found in Walworth ie Coroner or non emergency ambulence called for did they already have a Jayme found dead release ready to go? You would have to ask this indirectly because it would be an out for them to back date such a release. Jayme looked a bit pale in the photo with her Aunt but stress should still be evident in her face even with smiling after this.